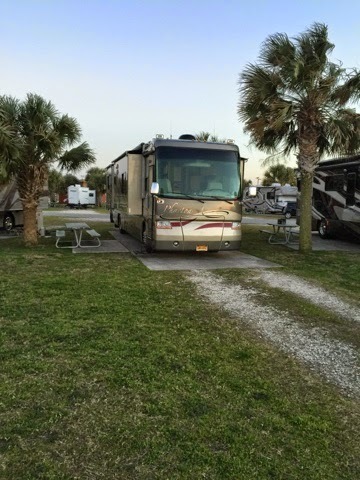 On Thursday morning we got ready to depart Camp Lake Jesper RV Park in Hardeeville, SC. Bonnie took the truck and drove to Walmart to get dog & cat food and to do some general shopping. (Yes we have to go shopping too)!! I took the RV to Camping World to fill-up the propane tank. 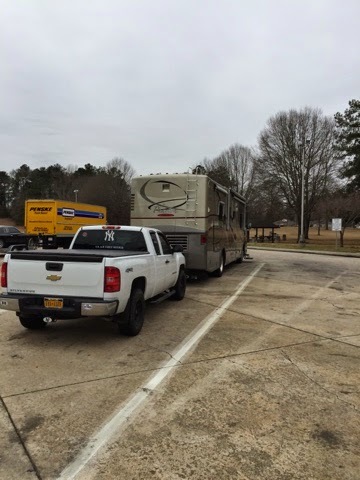 We then hooked the truck to the motorhome and off we go. So we had about 165 miles of a drive to get to Jacksonville, FL area. 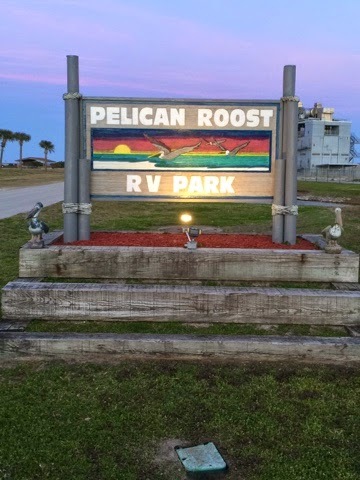 We are staying at a navy station campsite call The Pelican Roost Recreational Lodging in Mayport, FL. Because of the wind we had to drive a little slower on this trip. But we made it by about 3:30pm. RV is all set-up and we are good for the next five days. As you can see we have a nice site right on the water. 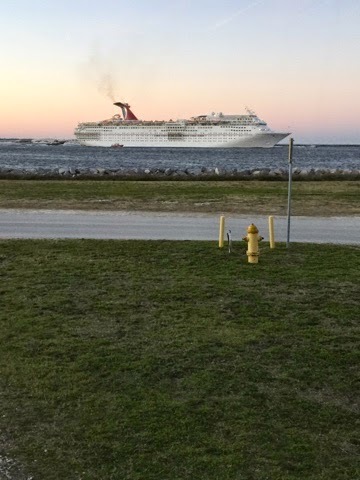 And we see very large ship's passing by from inside of the coach. We both are enjoying the site. Have met a few nice people. And are enjoying a little warmer weather. Next three/four days should have nice weather in the 60's and 70's. So we will start to check-out some of the area in and around Jacksonville. Your site looks absolutely tropical even though you are in the North (Florida, that is). We're jealous, but happy you are on your journey!............John and Carol B. Thanks John and Carol. It has been lovely here and we got some temps in the 70's this weekend.